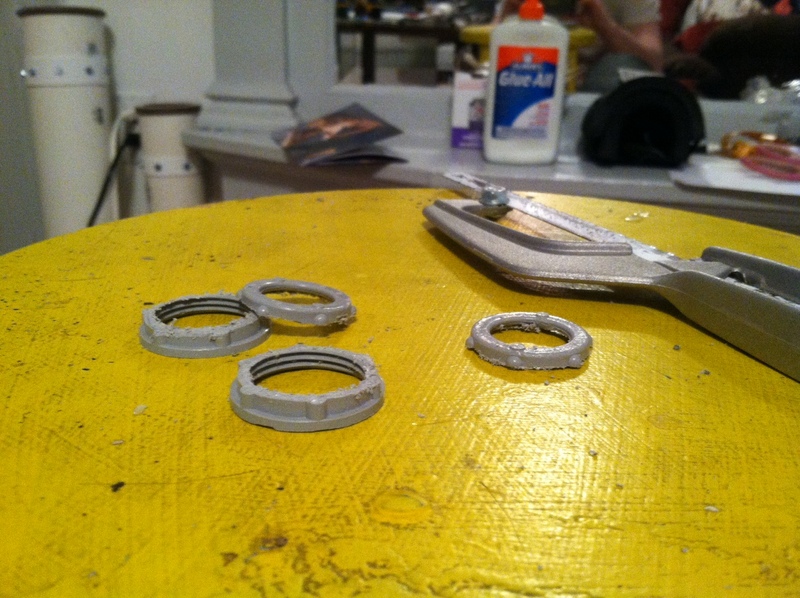 Now that everything had been painted, we could move toward our finishing steps for Eleanor Lamb’s syringe. This particular piece had already gone through a revision stage where we agonized over the panel, built the panel, agonized some more and then built a whole new panel. 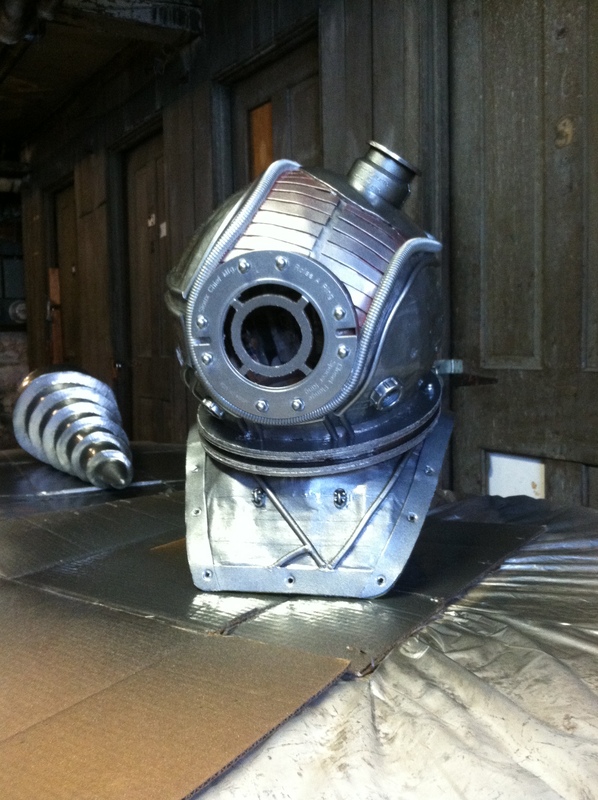 Little did we know that there was one more hurdle to jump in building this gnarly prop. More on that later. 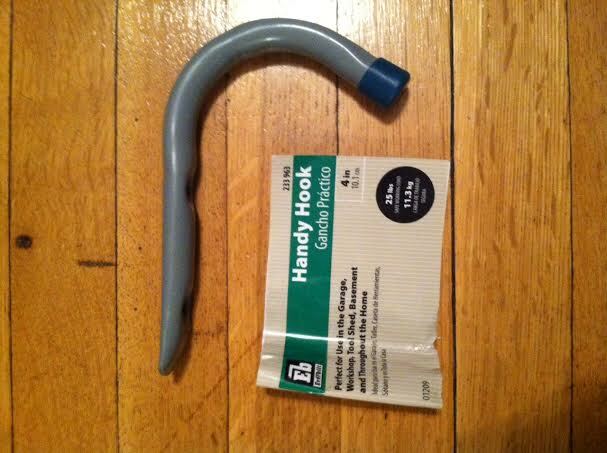 We started off with sliding closet door handles which you can buy at your local hardware store. The color we picked didn’t really matter as we planned to paint them before filling them with resin, which we did in our makeshift painting room, a.k.a. the kitchen. Once the paint had dried, we could really have some fun. After all the months of papier-mâché and foam work it was very exciting to work with a different medium! 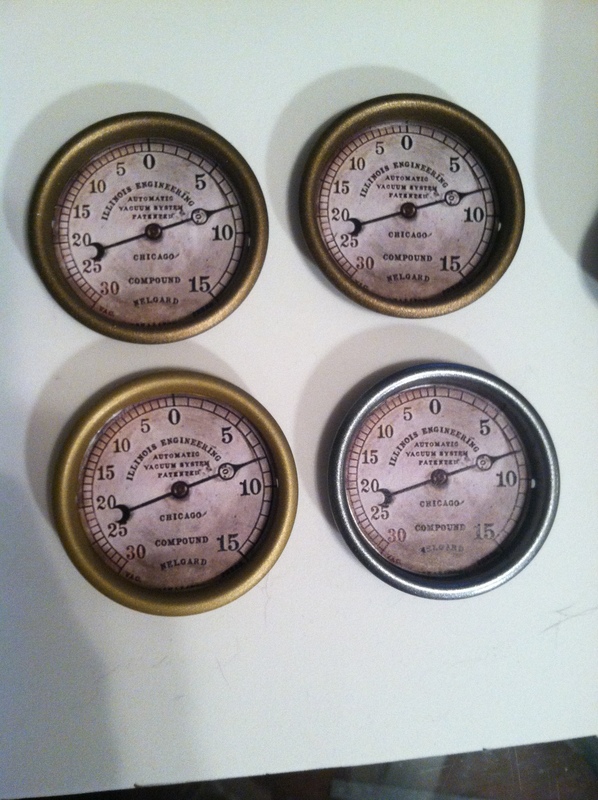 Jen, the wonderful blogger who provided the process we used, put the gauge faces she used for her project up on her blog for others to print and use. So we did just that! 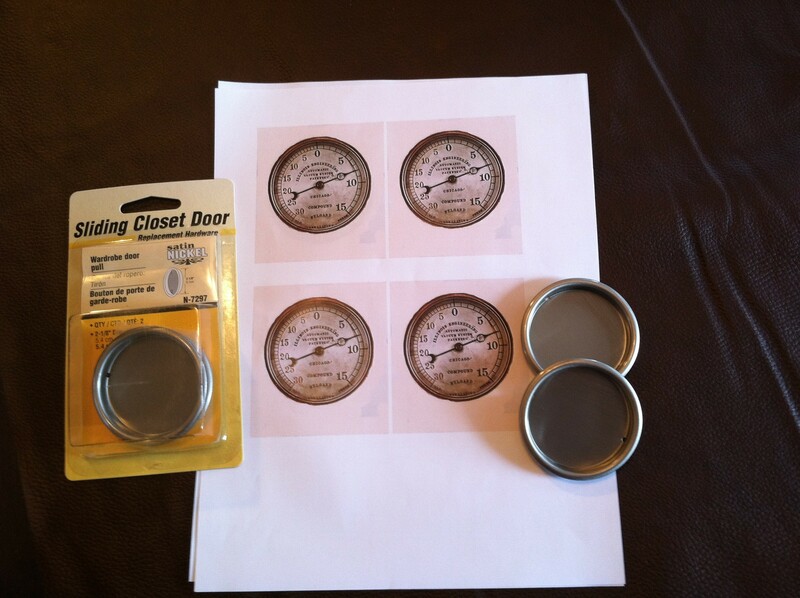 We put the gauge faces into the sliding door handles and got our work space ready to go. Next came the epoxy resin. 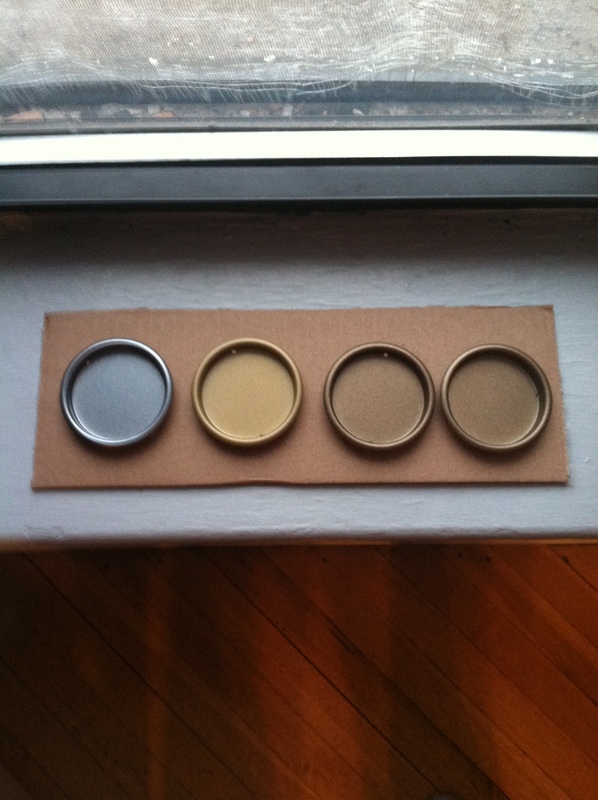 We purchased a basic kit from Michaels and followed the simple instructions that came with the kit without a hitch. 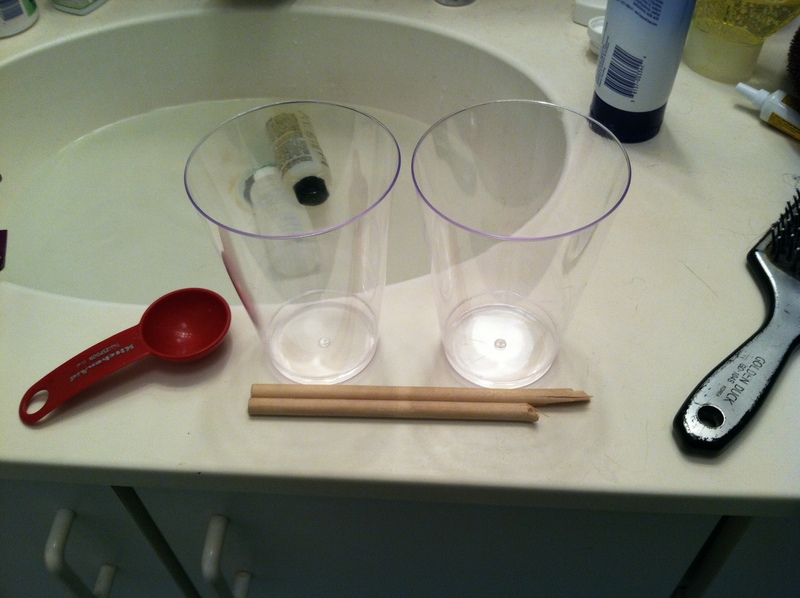 A word of advice, make sure that you have a disposable cup and stirring stick before you start. There’s nothing like getting all excited to play with a new process only to discover that you don’t have the containers and tools that you need. Using the two plastic cups we mixed together the epoxy and then poured it into the sliding door handles. There were bubbles, naturally. 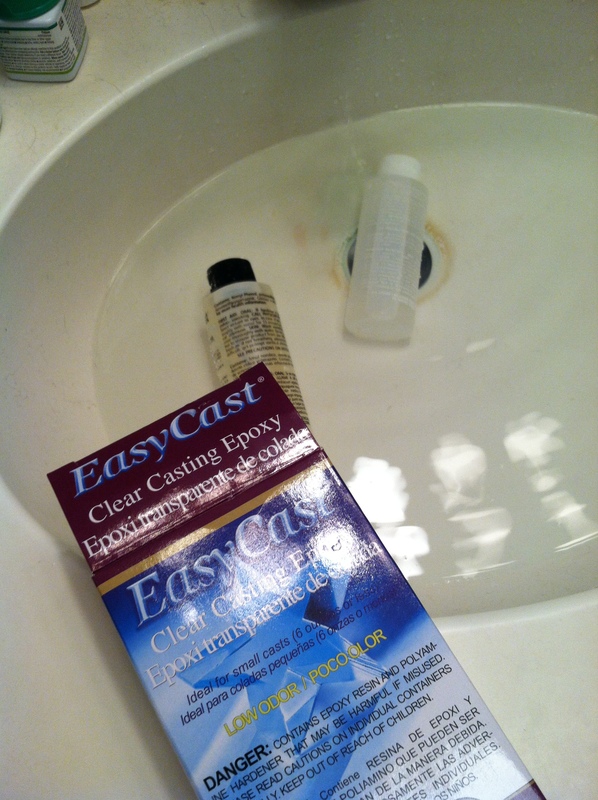 Using my hairdryer set on a low cool setting, I swept it across the surface of the gauges which worked out the bubbles. 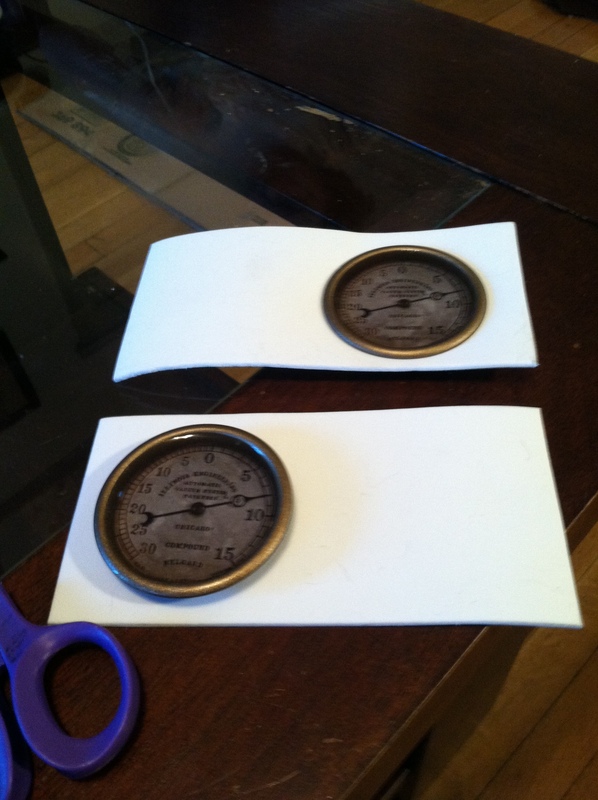 I made sure to take my time and sure enough, we got really clear gauges! Now for the hurdle, how to mount flat gauges on the curved surface of our PVC syringe. 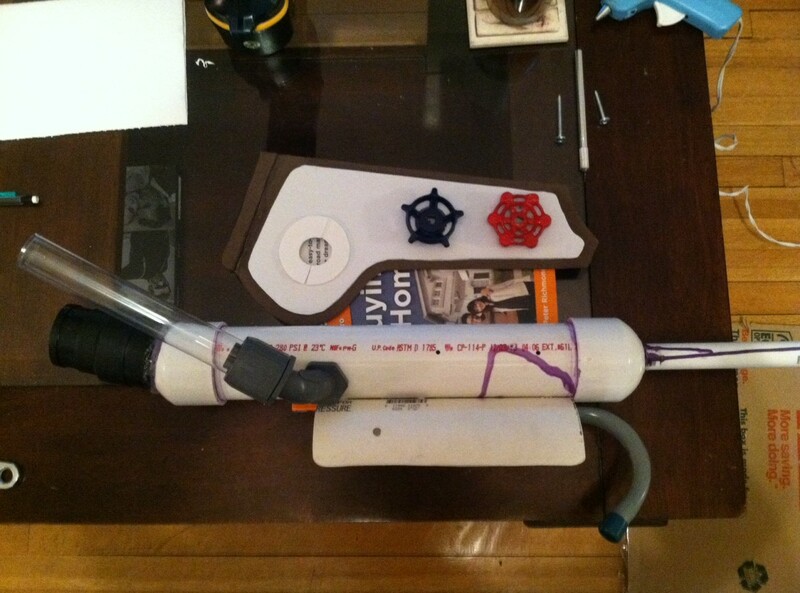 At first, we thought we could just mount it in some 2 mm craft foam and then wrap the foam around the pipe. The foam would account for the gaps and once we covered the sides it would look like there was a raised portion on the syringe were the gauges were mounted. This did not work out as planned. It was time for us to get innovative. We batted around some ideas and finally decided that we would need to carve a hole into the body of the syringe for the gauge to sit in. 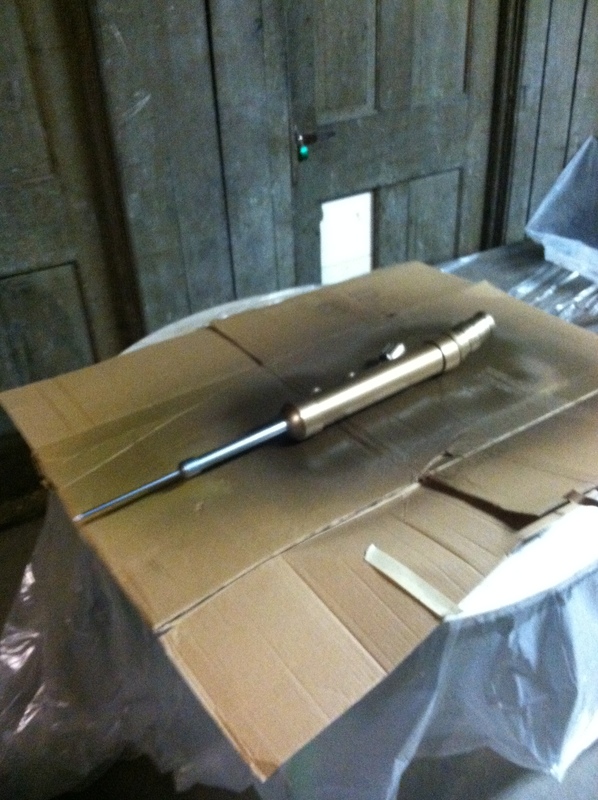 Since we had a freshly painted, beautiful syringe we were reluctant to do this without testing. So that’s what we did. 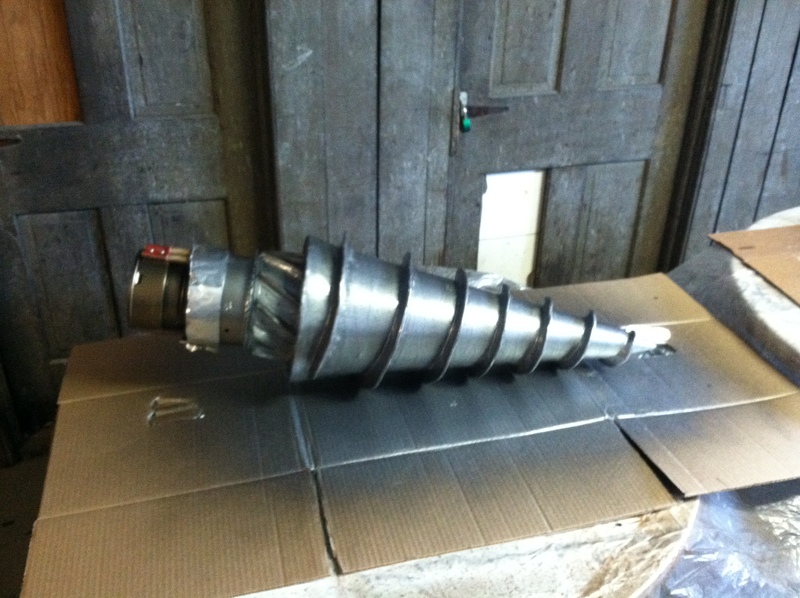 We took a spare piece of the PVC and drilled into it with the proper sized auger bit and, as you can see from the image below, the gauge fits into place quite nicely. 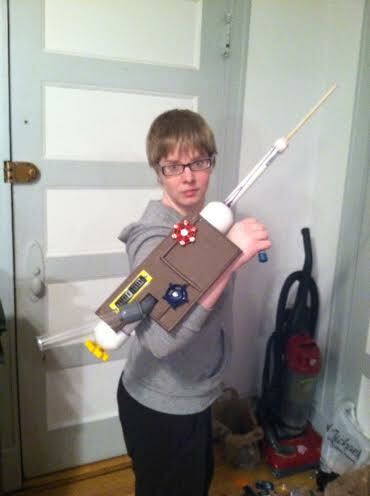 Armed with the confidence that comes from testing, we started work on the actual syringe. We got everything set up and Daniel was ready to cut in to our beautiful syringe when it hit him. 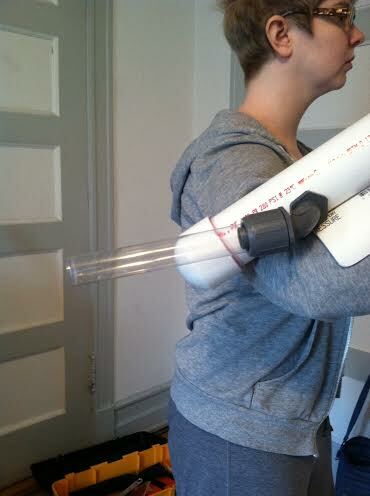 The thinner PVC pipe we used for the needle of the syringe extends through the entire body of the syringe for stability. If we cut into the body of the syringe, we would risk damaging it a ruining the whole piece. 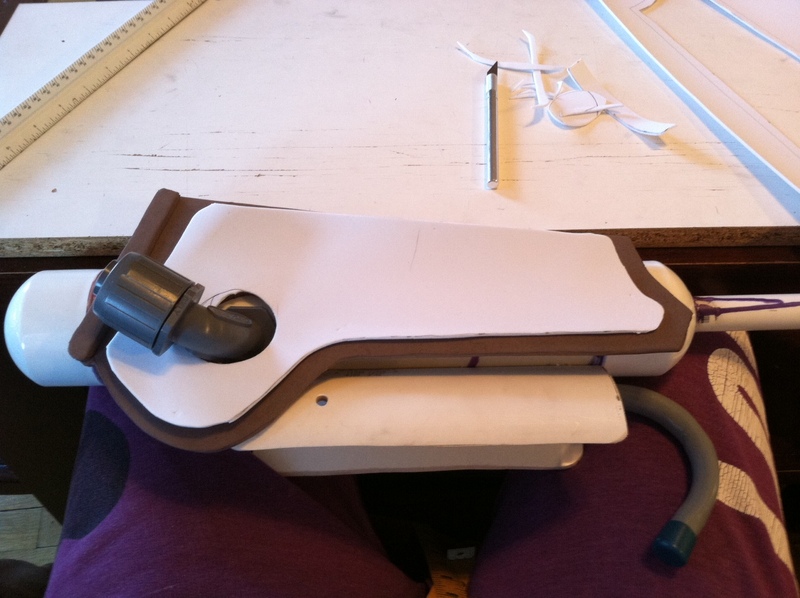 Plus, the PVC pipe would prevent the gauge from sitting fully down into the space. This meant that we were back at square one. We would have to figure out a way to mount the gauge on top of the surface of the syringe. 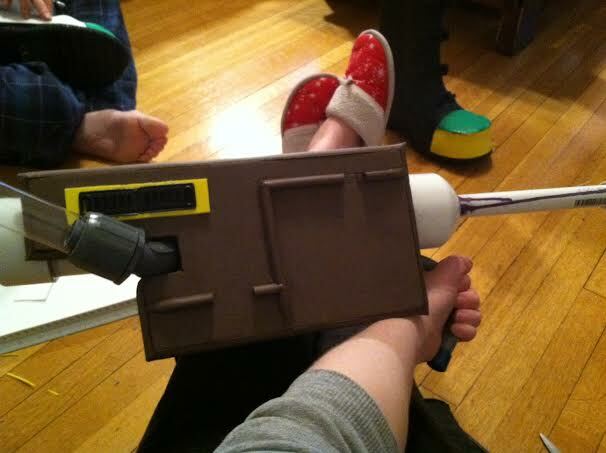 First, we removed the panel and added some spacers to the body of the syringe. Daniel used a hand saw to cut them in half so that the panel would be raised and we could run leather strips around the syringe. In the whole trial and error process, we also decided that the leather detailing was more accurate than the foam. Daniel then cut some brackets out of 5 mm craft foam to help “square up” the round surface. The brackets also served to close the gaps on either side of the gauge and give the effect of a raised panel that housed the gauges. We used two strips of hand detailed leather straps and put the gauges into them. Then we put it all together. All that was left to do was put the panel back on, take care of any touch-ups to the paint job, weather it using the technique out lined in our Weathered Metal Effect Tutorial and add the ADAM tube which we purchased from Scrapbook.com and then filled with red body wash, pomegranate scented for anyone who’s curious. 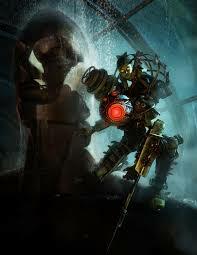 And with that hurdle behind us, we had finally completed Eleanor Lamb’s syringe! 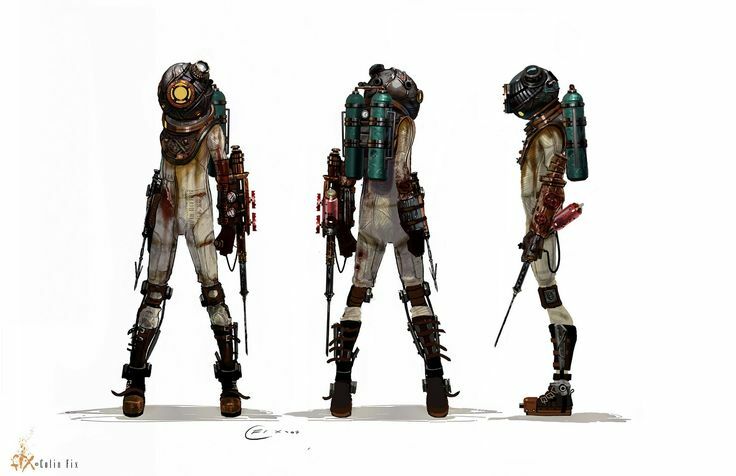 Between the posts for the harpoon and the posts about the syringe, you might have noticed that we haven’t mentioned the gloves yet. Well here’s your bonus tidbit! 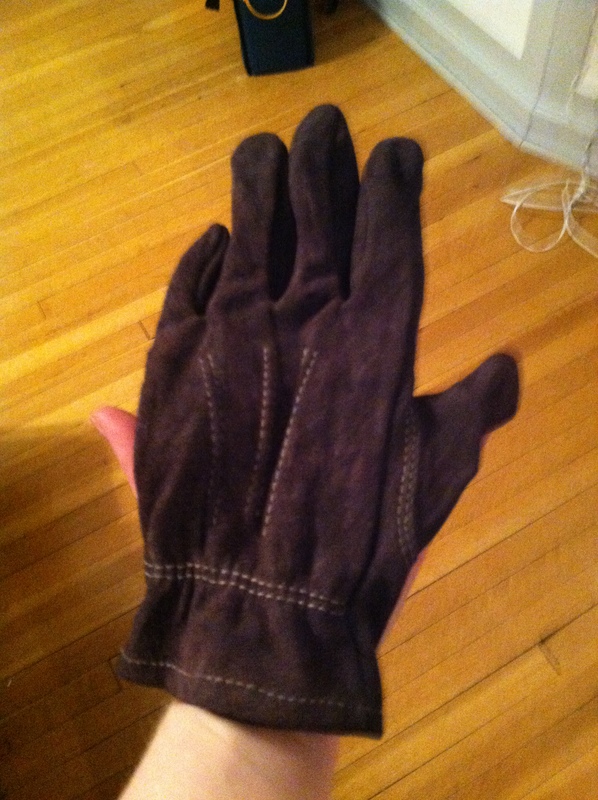 We found a pair of gardening gloves that were a light-colored leather and then dyed them. 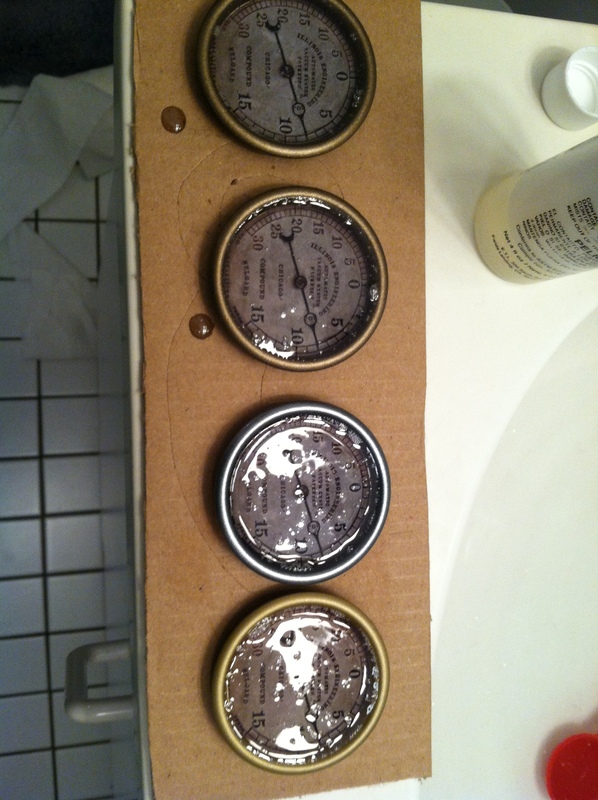 We used Rit dark brown dye. First, I soaked the gloves in water until they were saturated. 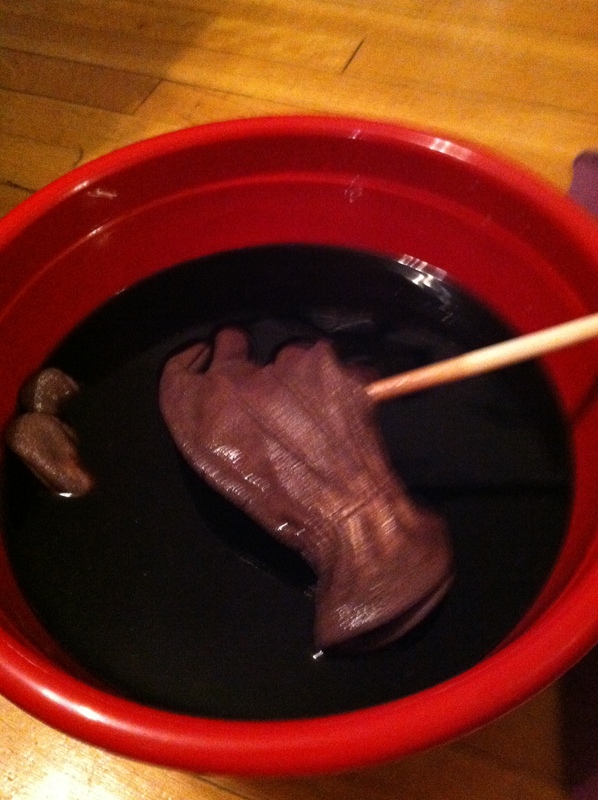 Next, I mixed up the dye and put the gloves in. I stirred them several times to ensure that the dye was taking evenly. 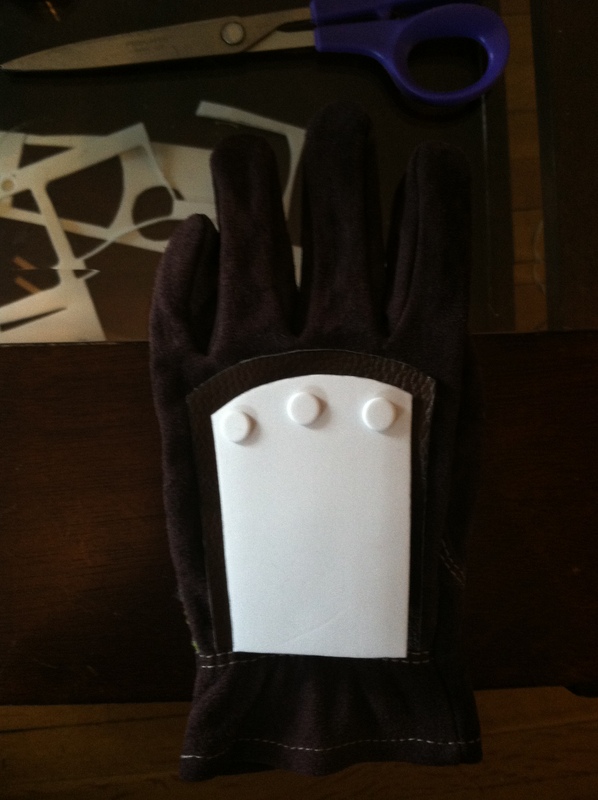 Since the original color of the gloves was so light it took about 45 minutes to get them the shade that I wanted. 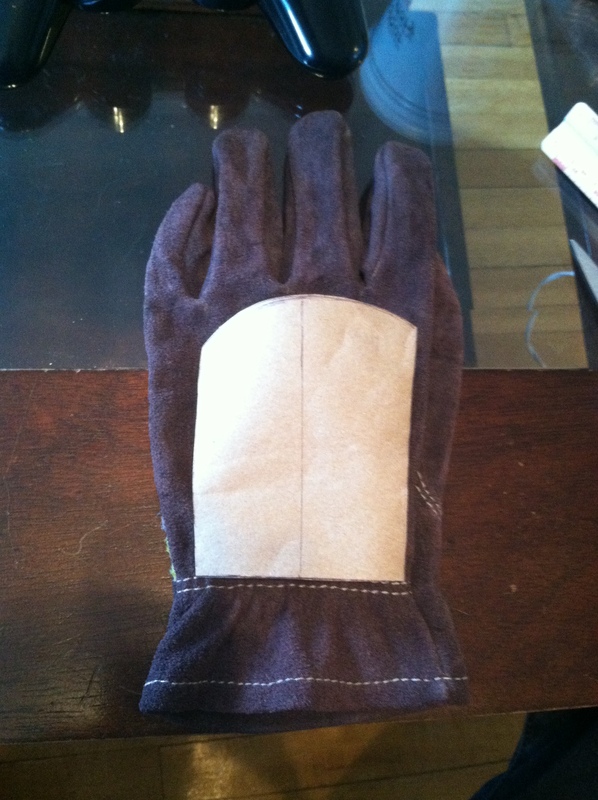 Once they dried, Daniel whipped up the metal plates for the top of the gloves. He cut the shape and the “rivets” out of 2 mm craft foam, sealed it with Elmer’s glue and then hit with some gold spray paint. 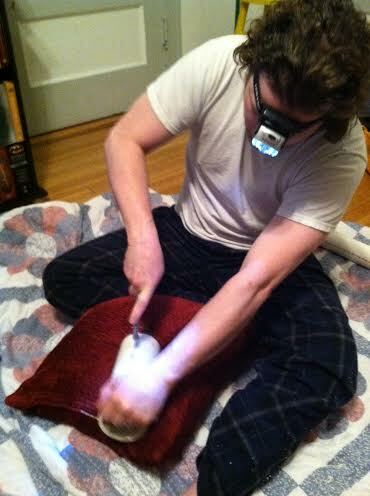 Using Shoe Goo, he glued it to the glove and let it cure for 24 hours. Level 4-2: Checkpoint Reached – Replay? When last we spoke about Eleanor Lamb’s syringe panel, I was obsessing over what some might call a minute detail. While it may seem that I had settled on a solution and crafted something I was pleased with, every time I looked at that darn thing my dislike grew and grew until I couldn’t stand it any longer. Something had to be done. Even though Daniel said that he had liked the old, boxy abomination, he must have been saying that to make me feel better because it was him that brought the blue prints for success to the table. Below you’ll see the old, hated panel after it had been taken off the syringe and then the blueprint for the new panel cut out of butcher paper and placed on the body of the syringe. I don’t know about you, but I was already loving the shape and I hadn’t even cut it out of foam yet! I happily threw away the old bulky panel and got to work on this new lovely piece. 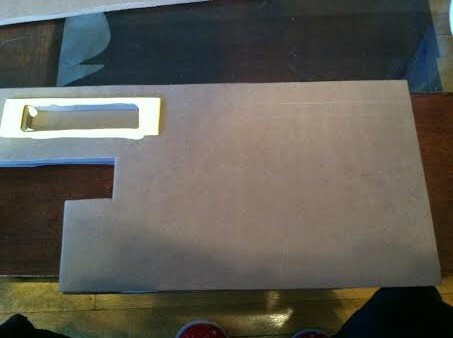 I cut the shape of the body out of 5 mm craft foam. I had to test it several times to make sure the hole was big enough for the 90 degree conductor could fit through. I wanted to add depth to it so instead of trying to add a thin border to the piece, I cut a smaller shape out of 2 mm craft foam and put it on top of the panel. 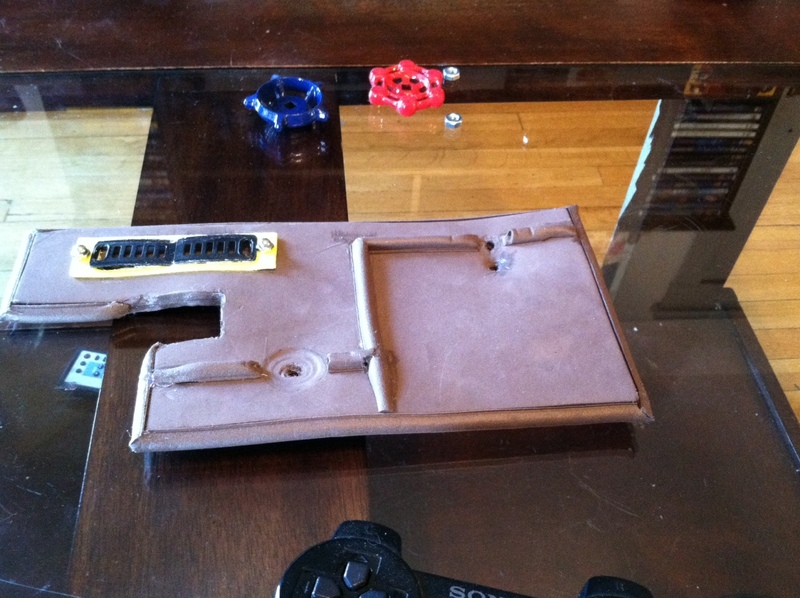 I also added a piece of 5 mm craft foam to the back-end for a bit of visual interest. I also cut out a little ring of 2 mm foam to cover up the ugly, too-big hole I needed to fit the panel around the conductor. With the faucet handles added to this new panel, I was finally pleased with the look of it. Hooray! Now we were ready to move forward. You’ll notice in the picture above, that the yellow gear from last post has been replaced with some PVC pipe coupling. 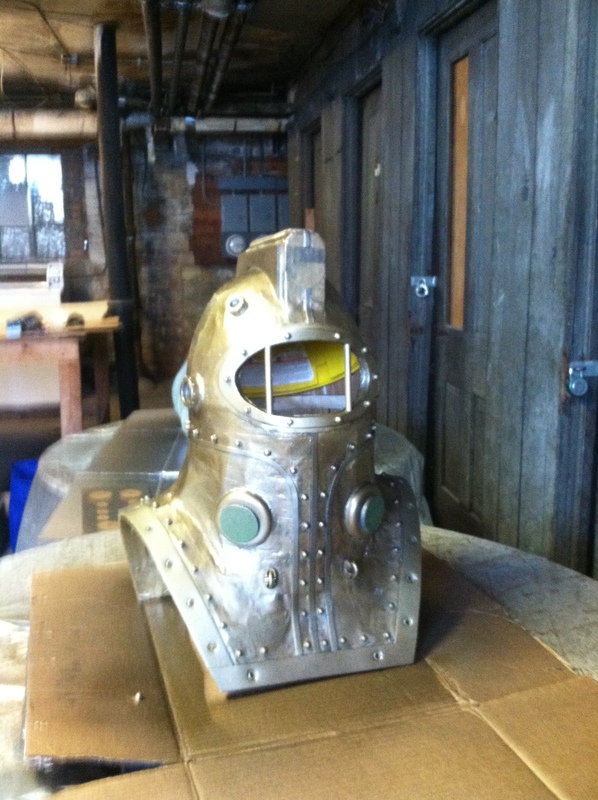 It’s the same material we used to add the “little hat” to Eleanor Lamb’s helmet. If’ you’ll look at the reference photo below, you’ll see that the panel extends up past the elbow. 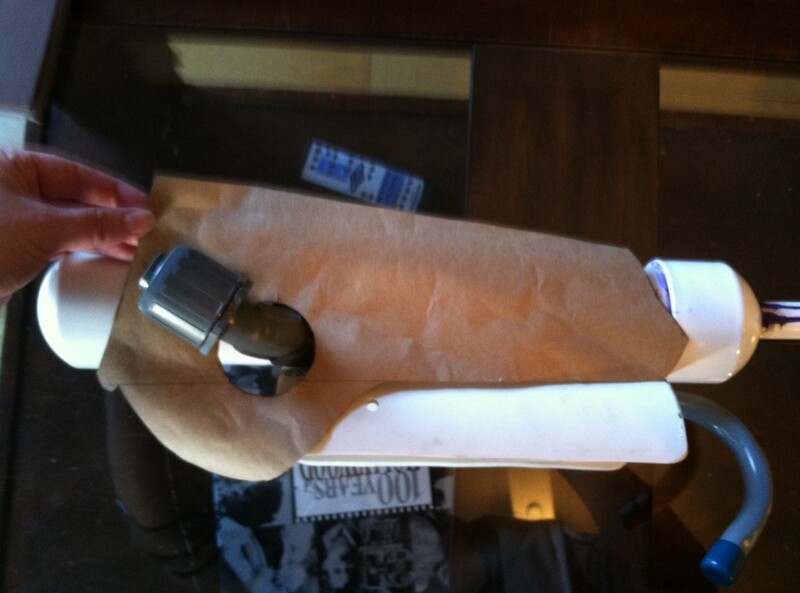 For our spin on this look, we opted for the coupling to extend the back of the body of the syringe. This helped to balance the weight of the syringe on my arm. 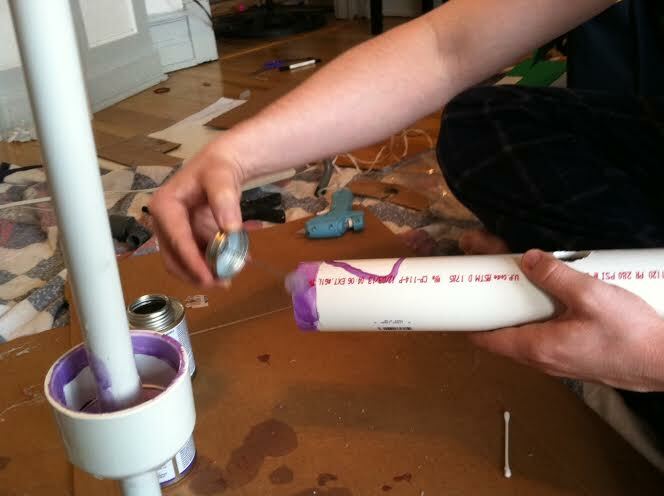 We had some trouble gluing the rubber of the coupling to the PVC plastic tubes. In typical Crazy Gilbert fashion, Daniel really slathered on the hot glue and we made sure to never pick up the syringe by that part of the body. Before we could proceed with mounting the panel on the body of the syringe, we needed to examine the valves on the inside of the syringe. Take a look at the reference on the far left. If you stare at it long enough, like Daniel and I did, you’ll notice that there are gaps between the gauges and the actual syringe panel. 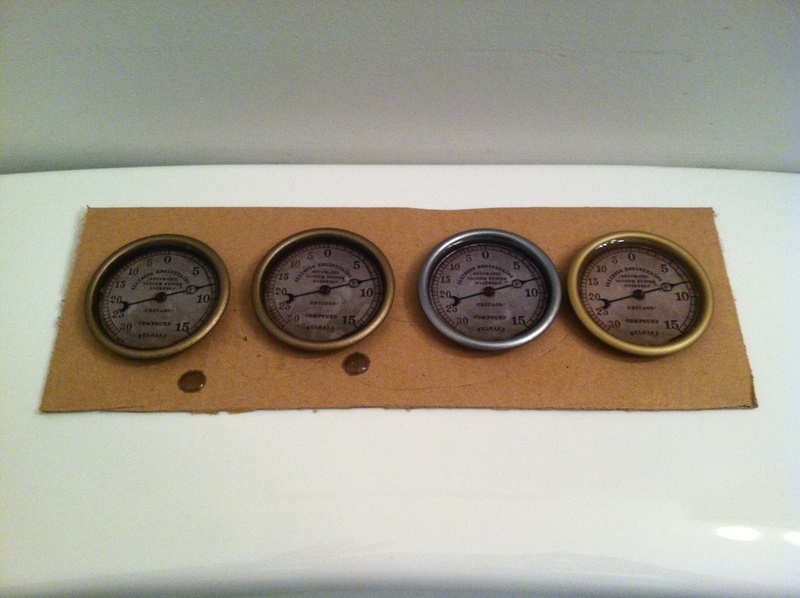 It appears as though the gauges are mounted on strips of leather, which are probably covering metal beneath, and then the faucets are attached to the side of the valve mounting. Our next step was clear, we needed to elevate the syringe panel and find a way to wrap the pieces holding the gauges around the body of the syringe. Some people embrace chaos, shaping something artful from the midst of scraps, saw dust and plastic shavings. Other people need organization, a step-by-step plan or a list so that they can track their progress. Isn’t it surprising that it’s taken eight months of work for us to make a list? And, wouldn’t you know it, we’re actually better off that we thought! 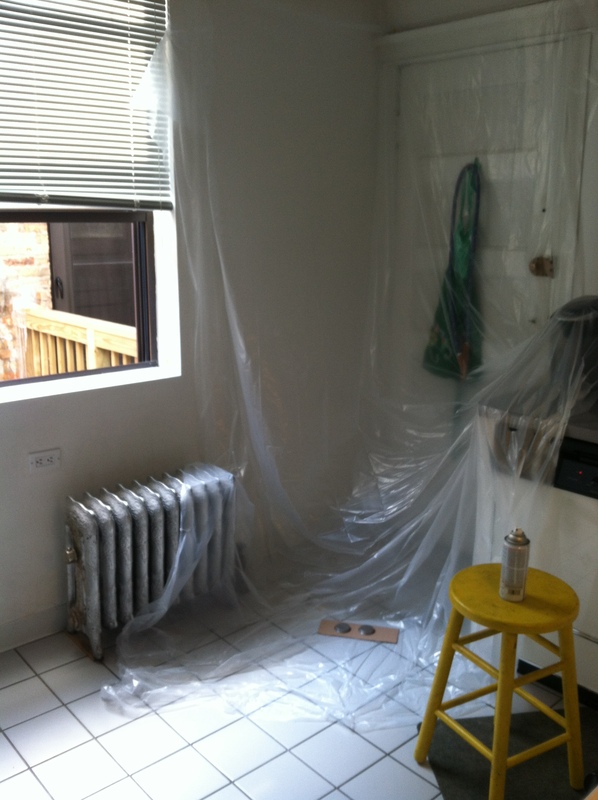 It turns out that we’re running out of things to do before painting, which feels pretty amazing! So, let’s pick up where we left off and hit the ground running. We’d just about done as much work on Eleanor Lamb‘s syringe as we could before painting but we were still missing the panel that runs along the side. This is an Eleanor Lamb action figure and it’s one of the best views that we can get of the side of her syringe. Just as Daniel spent hours obsessing over the details of Subject Delta’s drill, I spent hours obsessing over this single piece of the syringe. It would be easy to just slap a thin piece of cardboard on there, or maybe a piece of foam, but I hated how flimsy it looked. As you can see, it’s a very prominent piece of the syringe so it had to look just right. To start, I made a sketch using the measured dimensions from the syringe that we’d built. 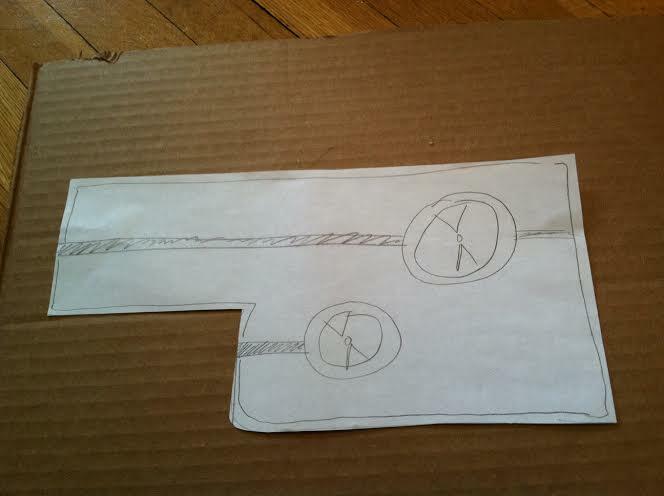 We found a couple of outdoor faucet handles that we planned to use, those are the circles on my little sketch. I also planned to use some rubber weather seal to suggest a tube running beneath the metal sheets which you can see as the shaded lines. 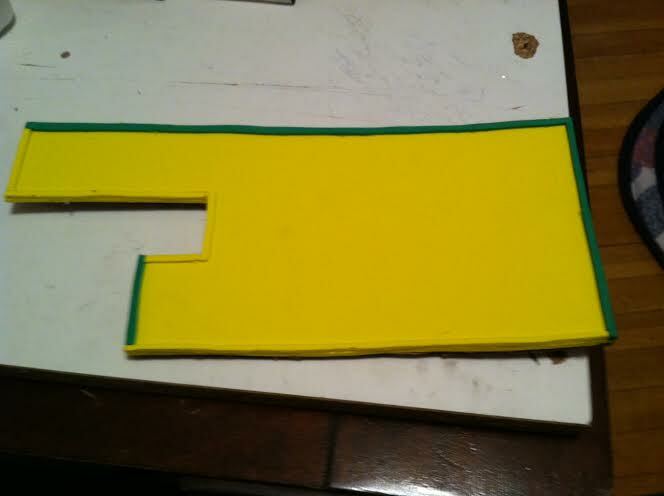 I liked the look of this, so I proceeded to cut the shape out in cardboard first and then in foam. I wanted to cover the cardboard in the foam to give the structure more substance. I then added a thin foam lining to the plate. 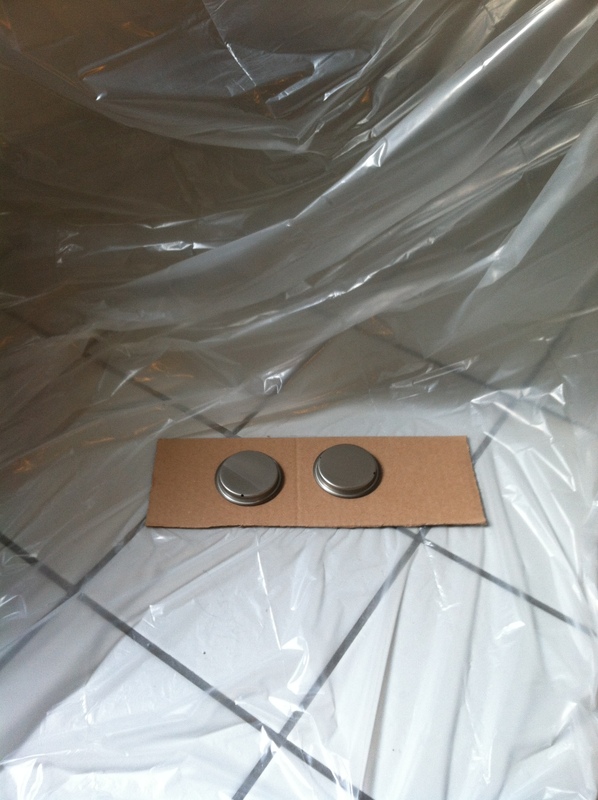 I wanted it to look like two flat sheets of metal had been pressed and sealed together. But it still looked and felt too flimsy to me. I spent a good long time staring at it, but no ideas came to me. I thought, maybe if I can determine what it’s function is, I’ll find a solution to my “builder’s block.” Regardless of what it’s actual intended use, we determined that our panel, on our syringe, was housing and protection for the series of tubes that extend and retracted the syringe needle. Now I knew for sure that what I had built was too thin; that there was no way it could house what I imagined but I went ahead and laid out the handles and tubing before I put everything together. Those two black, grate-like things are from the boots that Daniel bought for Subject Delta. He was working on his boots at the same time I was working on this darn panel and thought these would make the panel a bit more visual interest. The imaginary tubes would need some sort of ventilation with all the extending and retracting going on; so I added the grates to my little lay out. But even with all the cool looking details, I still hated it. It was too thin; too flimsy. It looked like an after thought or a sloppy detail that was tacked on because it was in the original character design and I was struggling to justify it. There it was; yellow, ugly and mocking me while Daniel reminded me for the tenth time that I needed to finish this and that there was so much more to do. I tried to cut a back piece out of foam that I could wrap over the cardboard. This would give me a rounded edge that might satisfy my image of pressed and sealed metal. This didn’t work because the shape was too wacky, also the width of the cardboard was too thin for me to manipulate the foam in the way I wanted. 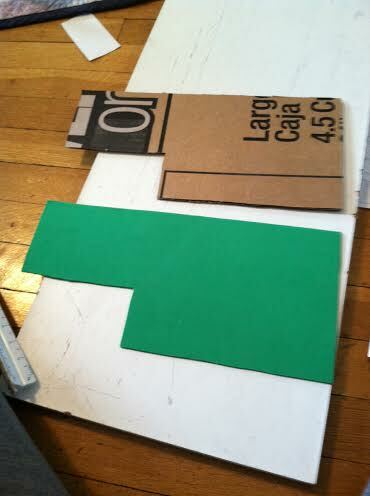 Next, I tried to sandwich the cardboard between two sheets of foam and then glue the foam together. 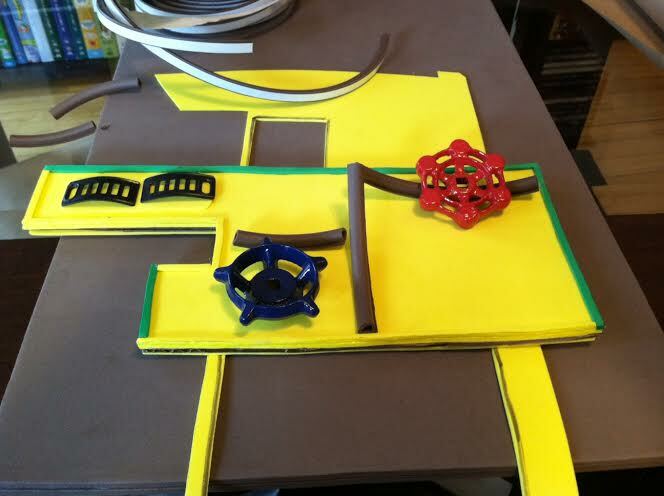 Then, I thought, I could cut out the desired shape from the glued together foam and curve the edges with the metal tip of the hot glue gun. Did it work? No. Again, Daniel asked how much longer I was going to stare at the panel and I didn’t have an answer for him. It was taunting me, begging me to just cut my losses, grit my teeth and go with the sub-par panel. Like the stubborn, Crazy Gilbert that I am, I kept staring at it and finally I landed on a solution. I used two sheets 5 mm craft foam. For the top sheet, I cut out a little hole which I lined in 2 mm craft foam. This is where the little metal grate-like pieces would go. 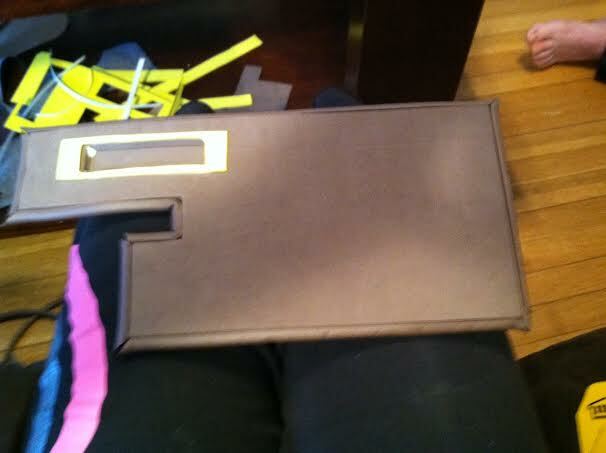 I glued the two sheets together using Elmer’s glue and then went to work on the trim. I nixed my idea of having a raised trim and instead opted for some rubber weather seal along the outside edge. Since my panel itself was thicker, I didn’t feel the need to imply that two sheets had been pressed and sealed together. I already felt better about the state of this panel and we hadn’t even added the bells and whistles yet! Next I added the rubber weather seal. Since the panel was thicker, the seal didn’t look too out-of-place. 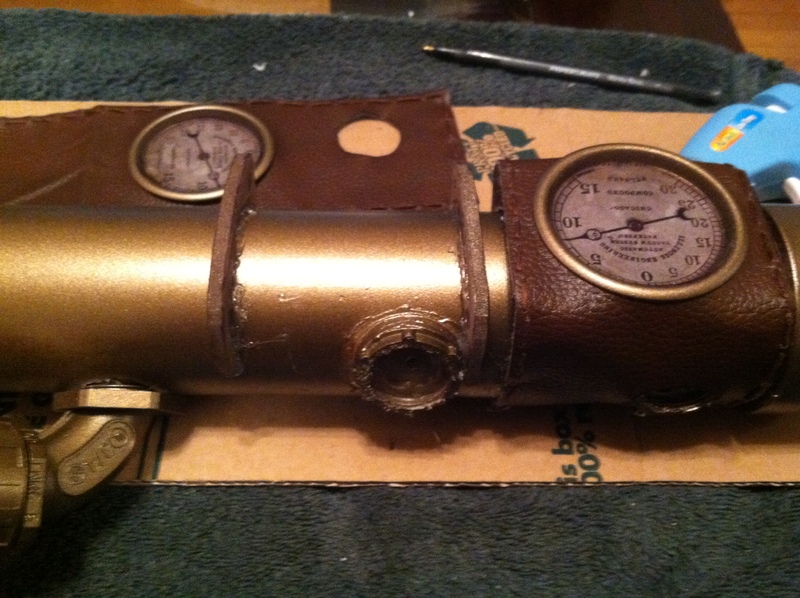 I wanted it to look like the tubes ran down into the handles so I cut the edges of the seal at an angle that I could then hot glue into the surface. 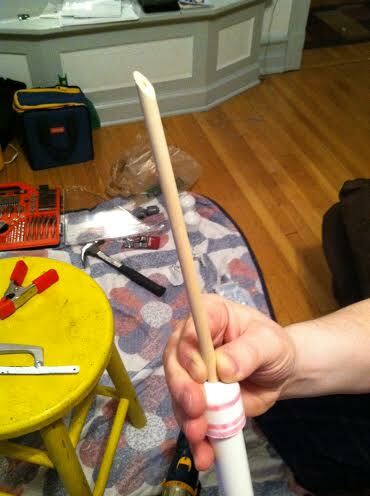 Then, Daniel drilled the handles through the foam into the body of the syringe which gave us our finished syringe! Even though it’s not entirely accurate to say that it’s finished, we’ve done as much as we can do until we Shellac and paint. After painting we’ll be adding a strap to the back side to help anchor the beast to my arm. So there are more details to come as soon as this Polar Vortex decides to move on along! Remember all those cosplay blogs where seasoned cosplayers would give tips and tricks and advice? Do you also remember how, in every advice filled count down of the most important things, there’s always the strong suggestion that you not wait until the last-minute. 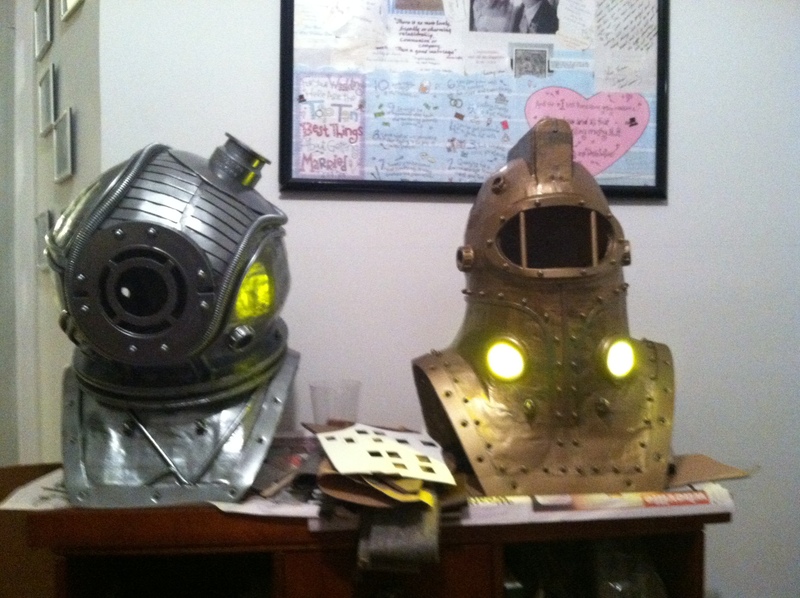 According to these gurus of costuming, if you wait until the last-minute the stress you experience will surely out weigh the joy of the process. Keeping this advice in mind, you plan on taking on your newest cosplay endeavor with plenty of time; say perhaps 10 months? Certainly 10 months is enough to leave one with enough breathing room to sit back and enjoy the fruits of his months of labor right? It’s true. We’re down to a measly three months before it’s show time and this, beloved readers, is why our posts have become less regular. The evenings at the Crazy Gilbert household have become flurries of building mixed with sleeping and the occasional playing of video games because, let’s face it, Last of Us is just worth a couple of hours a week and you all know it. For the past two weeks, we’ve had a decision to make each evening, take time to scrawl out a post or get in as much work as possible. Even as we speak there’s stitching that needs to be done so this will be a quick post with lots o’ pictures for your viewing pleasure. 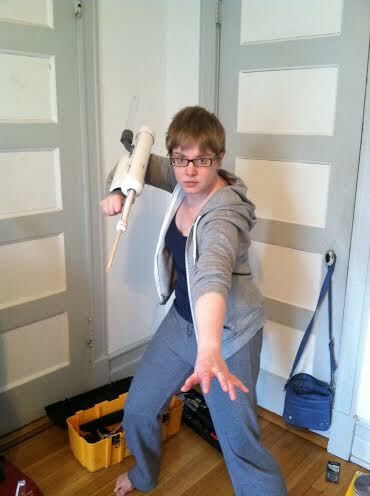 Since finishing Subject Delta’s drill, we decided to move our focus over to Eleanor Lamb and her arm toting weaponry. Our first focus: the syringe. Check out the reference picture. 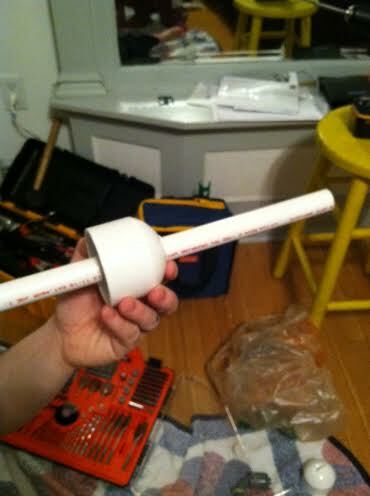 We started with some PVC pipe and a dowel rod. Since we’ve been doing more building on week nights, we have to be more conscientious of our neighbors. We’re Crazy Gilberts not Rude Gilberts. So we needed something to muffle the sound of our hand saw. This was Daniel’s solution. Note; those are pillows that I brought to the marriage. 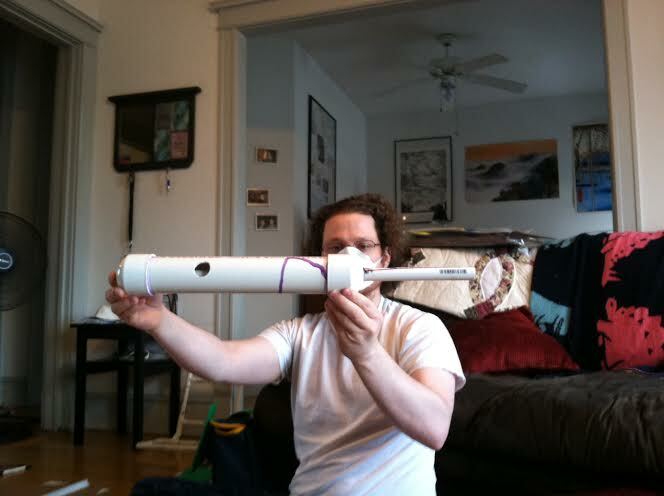 This is Daniel sawing a PVC pipe in half for the base of our syringe. 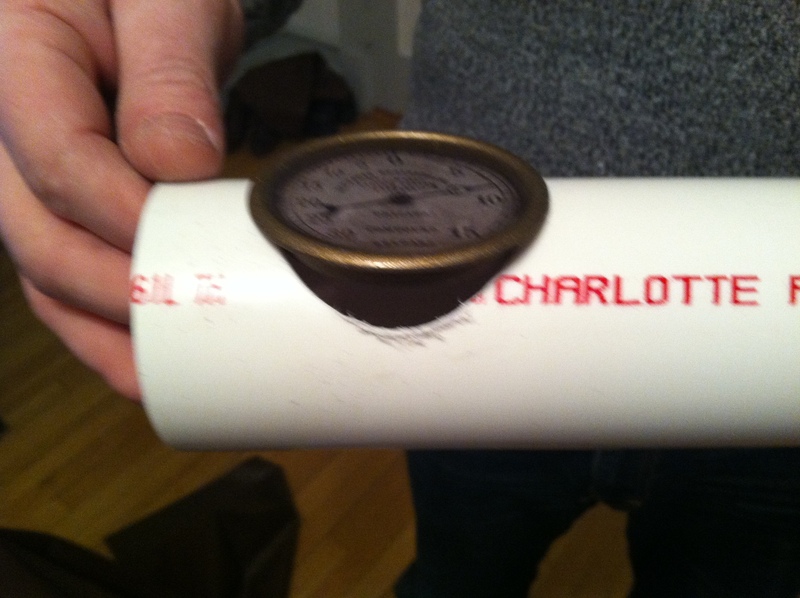 Once it was sawed in half, I took some sand paper to it and rounded the edges so it wouldn’t dig into my arm or wrist. The hardest part of this step in the process was not having the proper tools. A jigsaw would have saved time, spared Daniel’s arm and salvaged my throw pillows! 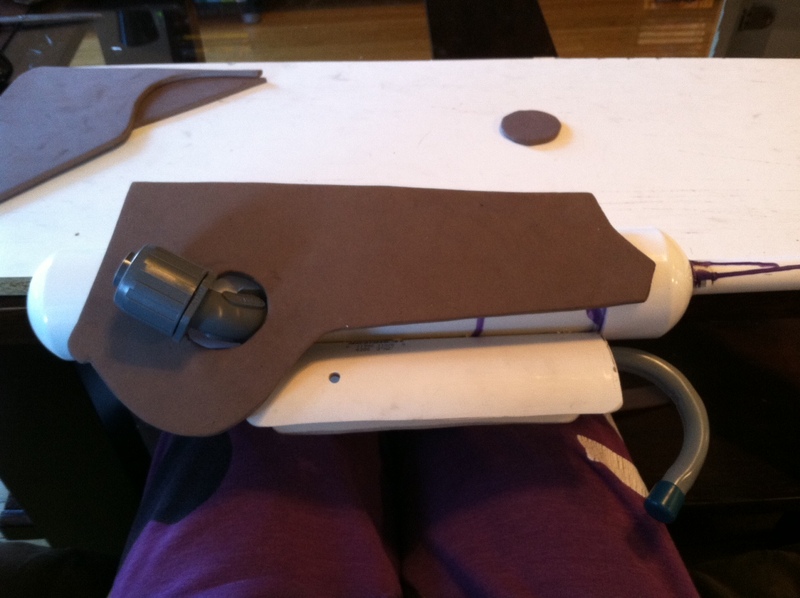 Next, we took some PVC socket caps along with some more pipe and started on the body of the syringe. 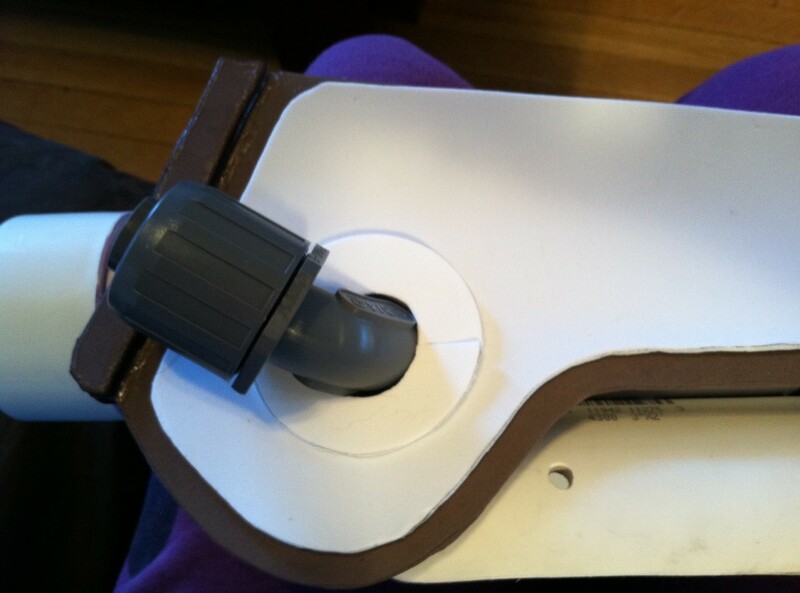 We drilled holes into the center of a large and a small socket cape and started piecing our syringe together. 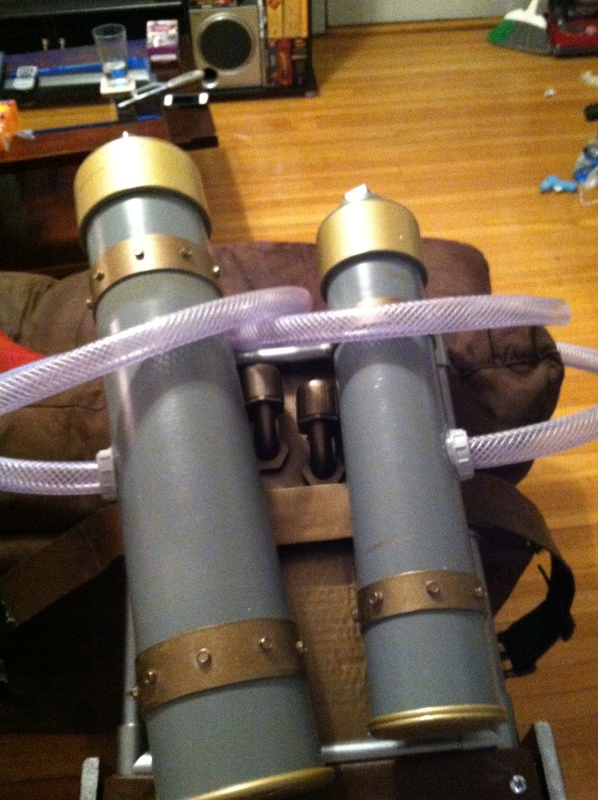 The nice thing about PVC is that all the tubes have corresponding caps so most sizes will have a cap that will fit! Next came the needle. We took a dowel rod and Daniel sawed the end off at an angle. He then took his drill and a teeny, tiny drill bit and drilled a bevel into the dowel rod. Bevel is a fancy word for hole. 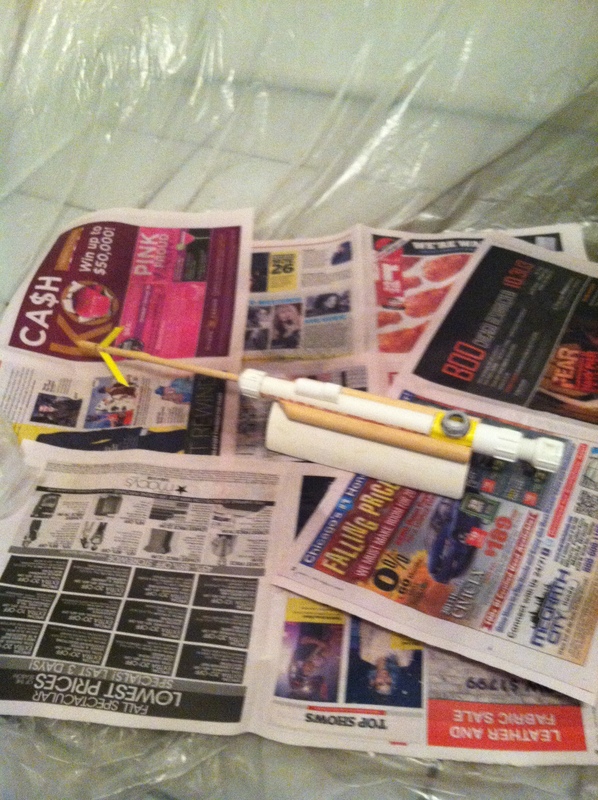 We then rounded the edge with sand paper so no one freaks out about a sharpened prop weapon at C2E2. With the three pieces in hand, we needed to glue them together. 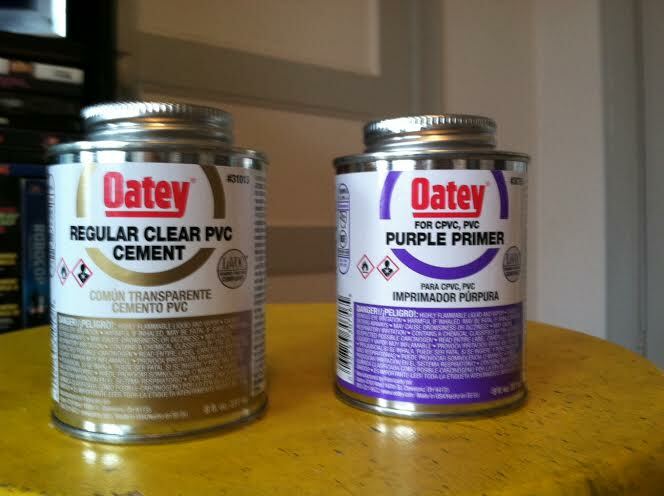 Since we were working with PVC, we took advantage of an adhesive made specifically for PVC; Oatey PVC Cement. 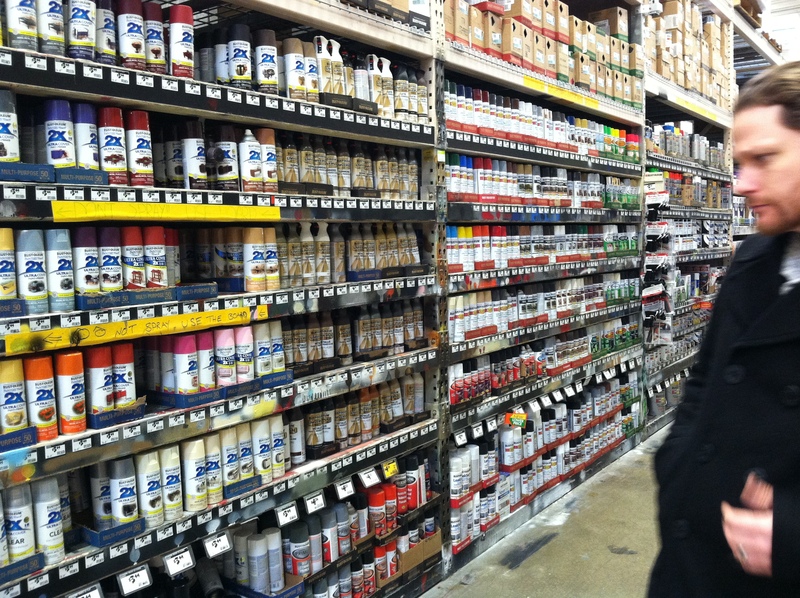 We decided to go with a two pack of primer and cement. This stuff had a serious odor and we finally got some use out of the masks we bought for Shellacking. We also opened the windows and turned the fans on and it was still a very heavy scent. 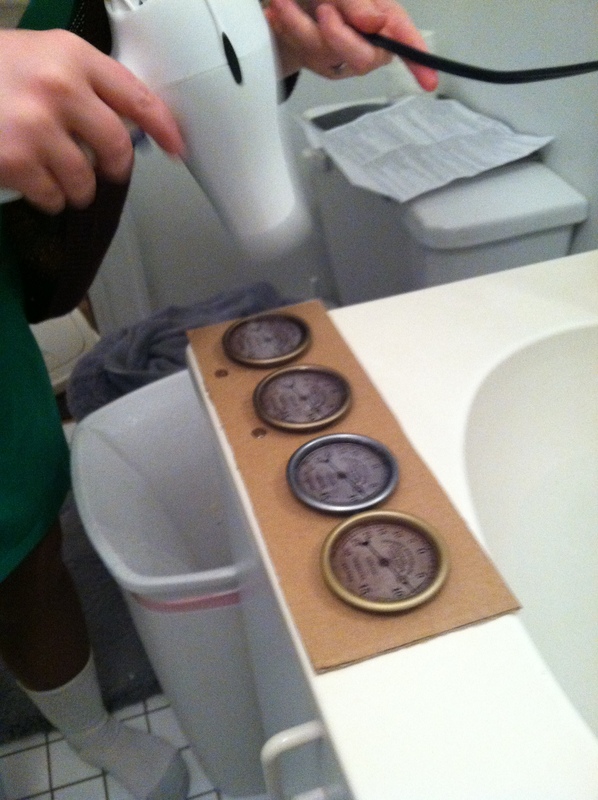 Since the weather nor the apartment complex we live in offered any better ventilation options, we made sure to work quickly and seal up the bottles promptly. Look at what we have here! That hole you see in the side of the main tube is for this nifty little doo-dad that caught Daniel’s eye at Home Depot. A 90 degree conductor of the non-metallic variety! And wouldn’t you know it, my clear plastic tube fit into it perfectly. 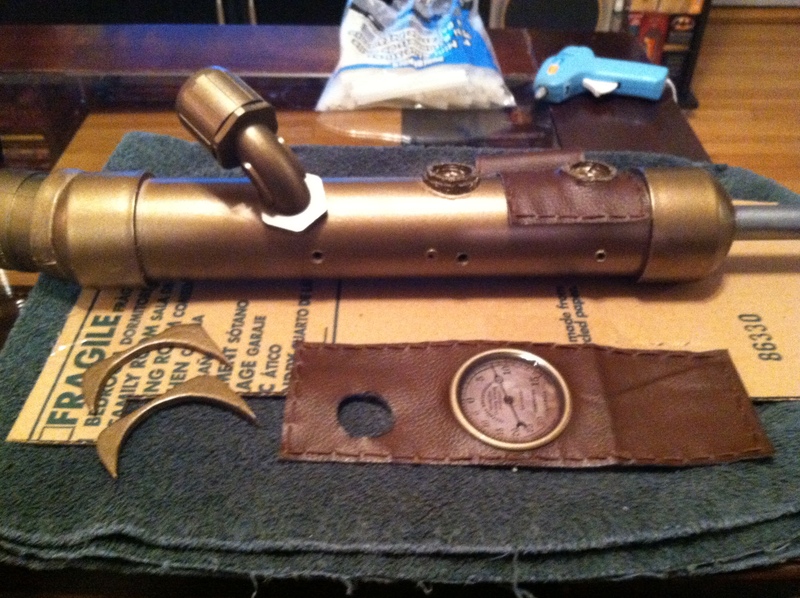 And, when screwed into the side of the main tube, it makes a really amazing looking ADAM tube. For the handle, we used a plain Jane Handy Hook which Daniel hammered flat and then screwed into the base of the main PVC tube. 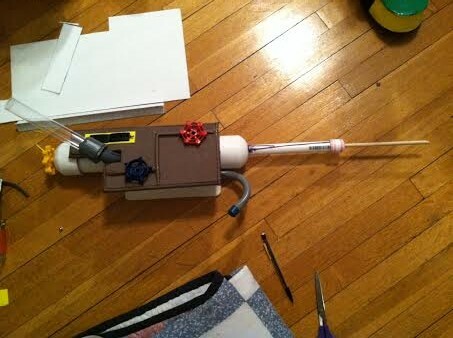 And since we’re in the habit of giving you a mildly awesome picture at the end of each post, it’s only right to let you know that we refer to these as “action shots.” So here’s a nearly finished Action Shot of Eleanor Lamb’s syringe! !